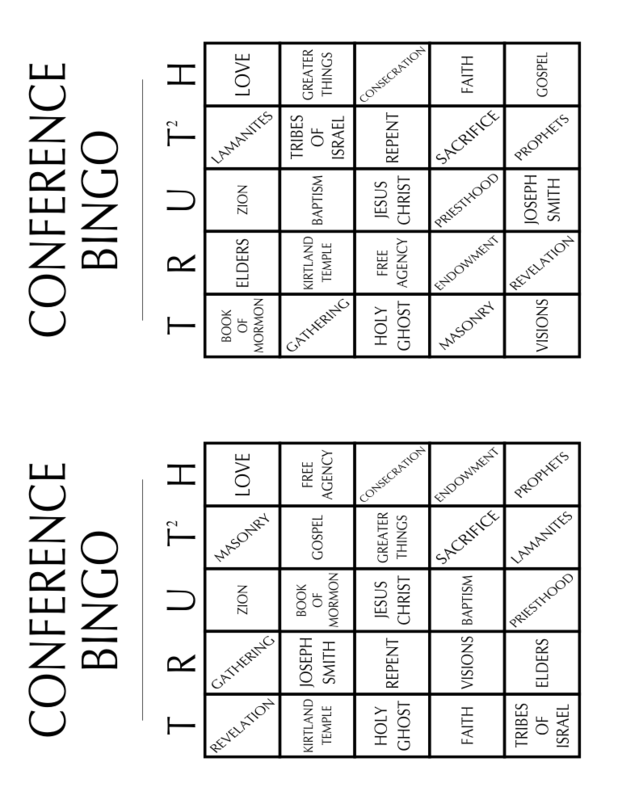 With General Conference going on I thought I would write something for the occasion. The first General conference of the church was held on June 9th, 1830 in the Township of Fayette, New York. From the minutes of the conference we can see that there were six elder’s present, Joseph Smith Jr., Oliver Cowdery, Peter Whitmer Jr., David Whitener, John Whitmer, and Ziba Peterson. In attendance at the conference were most of the male members of the church. The Conference started with Joseph Smith reading chapter fourteen of Ezekiel. He then gave a prayer. After this the Articles and Covenants of the church were read by Joseph Smith, jr. All in attendence then voted to accept them. The vote was unanimous. Following the vote Samuel H. Smith was ordained an Elder by Oliver Cowdery. Then Joseph Smith sen. and Hyrum Smith were ordained as Priests. Many people including, those just ordained, then received their licenses. The Elders were David Whitmer, John Whitmer, Peter Whitmer, Ziba Peterson, and Samuel H. Smith. The Priests were Martin Harris, Hyrum Smith, and Joseph Smith sen. The Teachers were Hiram Page and Christian Whitmer. The Conference then continued with exhortations by Joseph Smith, jr. and Oliver Cowdery. The Conference was then adjourned until September the 16th that same year. Oliver Cowdery was appointed to keep the church record and the conference minutes. Then all the brethren prayed. There were thirty people in attendance. The conference was opened by singing and prayer. They then partook of the sacrament with bread and wine. Following this, many people who were recently baptized were confirmed. After the exhortation as mentioned in the minutes the Holy Ghost was “poured out” upon those who were there. Many of the people present prophesied, others saw visions, others were overcome and had to be lain down. After those who had to be lain down regained their strength they spoke of the things they had seen. There was sense of “rapturous gratitude” that they were witness to the “very same order of things as observed by the holy Apostles of old.” In this first General Conference of the church it was not enough to simply enact church business but that the manifestations of the Spirit were present. There were praising the fact that many people in attendance prophesied and had visions. However there were not enough members present to make a quorum so the conference was adjourned until later that day. When the meeting was reconvened they sang a hymn and Elder Heber C. Kimball gave a prayer. Brigham Young and Thomas B. Marsh presided. There were some ordinations recommended in the name of the church and the meeting was adjourned until the next day. During this next session, if you will, Elder Benjamin L. Clapp reported on his missionary travels in Kentucky. A call was made for Elders to volunteer to go and do more missionary work in that area of the country. The Elders who volunteered were: James Carroll, James Galliher, Luman A. Shirtliff, James Dunn, Ahaz Cook, Isaac Decker, Cornelius P. Lott, and Alpheus Gifford. Thomas B. Marsh then gave instruction to the Elders who volunteered. After this John Taylor was “voted” (that’s a quote, meaning that yes that actually voted on him not just sustained him) to fill a vacancy in the Quorum of the Twelve. There were some more ordinations made, followed by remarks given by Elder Kimball to the elders. After this Bishop Partridge made a report on the temporal affairs of the church. The Conference was then adjourned until January of the next year. I don’t have any information if similar remarkable spiritual events occurred at this conference. It seems that the minutes don’t mention these things. 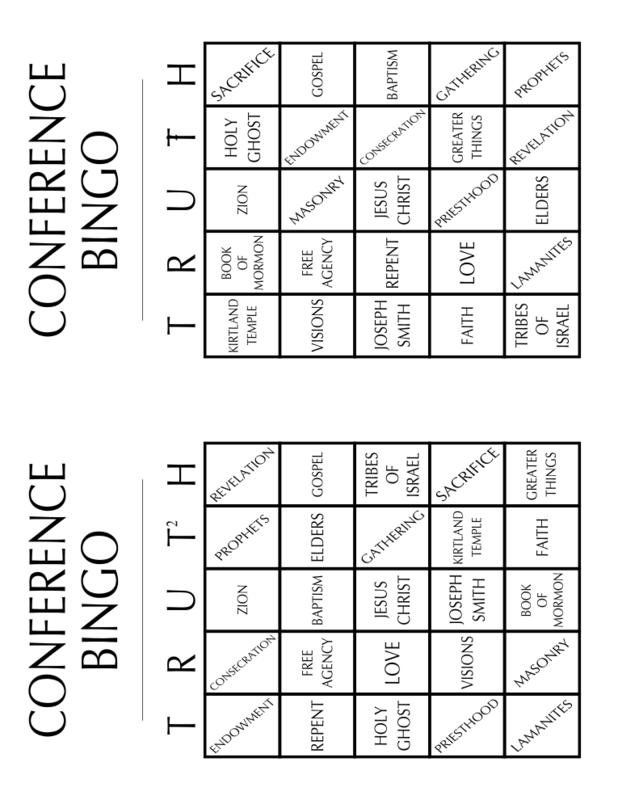 Regardless, we can observe the order of these early General Conferences. They were, in fact, meetings of the officers of the church to conduct business. Officers of the church from the various branches and stakes would go to the conference to conduct business and receive instruction. The followed the instruction given in Doctrine and Covenants section 20. If you are watching General Conference today, observe to see if it follows the same pattern revealed by God to Joseph Smith in April of 1830. 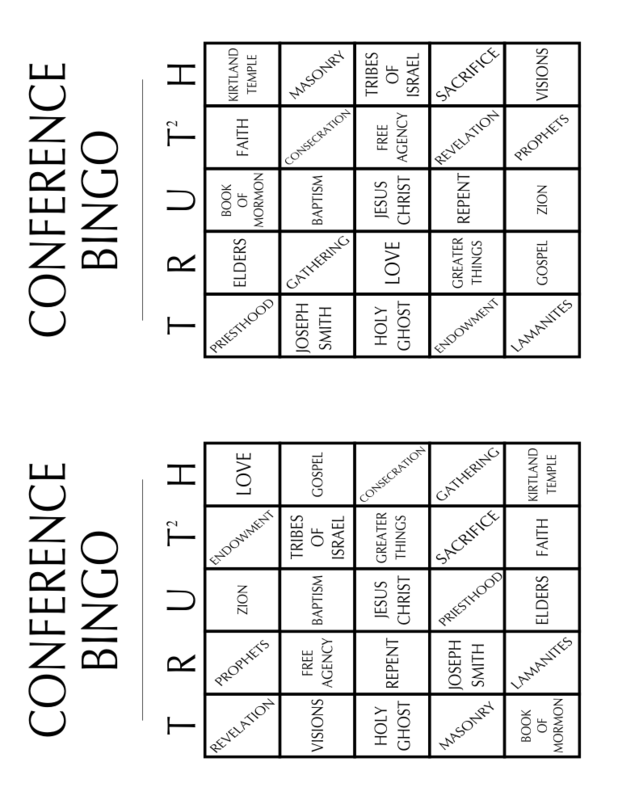 If you don’t enjoy Conference Bingo you can take three sheets of paper. On the top of one write, “Revelations”. On the top of another write, “Visions”. On the top of the last write, “Prophecies”. Then as you hear prophecies, revelations, and visions given during conference write them down. Funny that you should mention that “Newel Knight” experience. Just a few days ago I was studying casting out evil spirits. I wondered why we can read of multiple cases of Jesus casting out evil spirits during his ministry and not have any examples of Joseph or his followers doing the same. Come to find out, this was due to my personal ignorance. As a matter of fact, the “Documentary History of the Church” compiled by B. H. Roberts states that the first miracle of the Church was Joseph Smith casting out “the devil” from Newel Knight. “[Newel’s] situation was soon made known to his neighbors and relatives and in a short time as many as eight or nine grown persons had got together to witness the scene. After he had thus suffered for a time, I [Joseph Smith] succeeded in getting hold of him by the hand, when almost immediately he spoke to me, and with great earnestness requested me to cast the devil out of him, saying that he knew he was in him, and that he also knew that I could cast him out. The General Conference experience zomarah cited comes shortly after (page 84), happening on June 1, 1830. Joseph cast the devil out of Newel in April. It could be a prophesy, could it not? But, a question I have is this: Is the “great cause” the church as it now stands (hierarchical priesthood, TM) or is it the gospel of Jesus Christ, independent of the hierarchy, TM? God has a hierarchy, but it’s quite opposite from the democratic system we’re used to. In God’s theocratic system, he calls those who will serve him. If they prove themselves trustworthy servants, then he choses (elects) them. So it’s a very top down approach. Man’s democratic system is that man chooses who will rule him, he votes for city, county, state, and federal leaders. This is bottom up, the opposite of how things are run in the Kingdom of God. There is no independence in God’s hierarchy. He is the one who creates it and if you want to be part of it, you must join it in the way He dictates. It’s amazing that even with the blatant fact that most all of the early apostles eventually fell & taught false doctrine before & after Joseph Smith’s death, hardly any members even think it’s a possibility today, that an apostle, let alone most or all of them, could also teach false doctrine & fall. Most members feel the very idea is absolutely inconceivable & wrong to even talk about. Usually every conference there are some false doctrines taught if you listen close enough, often it is very disturbing & destructive false doctrine, not just some small thing. It is our divine obligation to question everything that all the leaders of the Church do, say or write, from the Prophet down to ward leaders, to judge if they are righteous & trustworthy or not & teaching correct doctrine or not & doing their duties or not. But that’s too much work & responsibility for most people to accept. Blind & unquestioning obedience & believing the myth that ‘prophets can never lead us astray’ is so much easier. Exactly! You are spot on. That’s exactly what I have always thought. A broad generic sweep in today’s talk. Nothing even close to any of the three categories you put up. As usual, Zomorah, you have provided some valuable historical information that shows just how far things have strayed from the original church of the Restoration. Thanks for your good work. As a born & raised Mormon who took a similar approach nearly 15 years ago to seek history over tradition, I commend you for your choice to investigate, and I am happy to have stumbled upon your blog. My journey took me down a path that led to eventual atheism and strong apostasy against the church – but my findings and conclusions were very similar to yours during my early years of investigation. The road ahead will not be easy for you, but you are doing yourself a true justice by seeking the truth. I wish you the very best. Thanks for commenting. Would you mind expounding more on how your journey led to atheism? I can definitely see how such a belief could easily be reached after leaving the “safety net” of the Church. Studying church history may lead you to atheism. That certainly was my personal experience, although I wouldn’t say I became a total atheist. I was more of an agnostic, because I couldn’t say for certain that there was no God, I just didn’t have proof there was. Thankfully God brought me low and got me to talk to him again. He opened my mind to things I’d never considered before and now I feel far more at peace than I did before my agnostic phase or during it. If faith is the seed, then (as in gardening), you’ve got to break the soil (heart) in order to plant the seed. I pray you and others like you will have this difficult experience that you may come to know your creator. Hehe. It does seem awhile doesn’t it? Get to it Zomarah! …well, actually I wouldn’t encourage you to write unless you felt inspired to. You can’t force inspiration. If you try to you end up with garbage. At least that’s been my experience. Noblenarcissist, that is so true: One cannot force inspiration and expect to end up with something inspired. That’s too bad you’ve been sick. Not fun. Glad to know you’re working on some posts, though. Appreciate that.